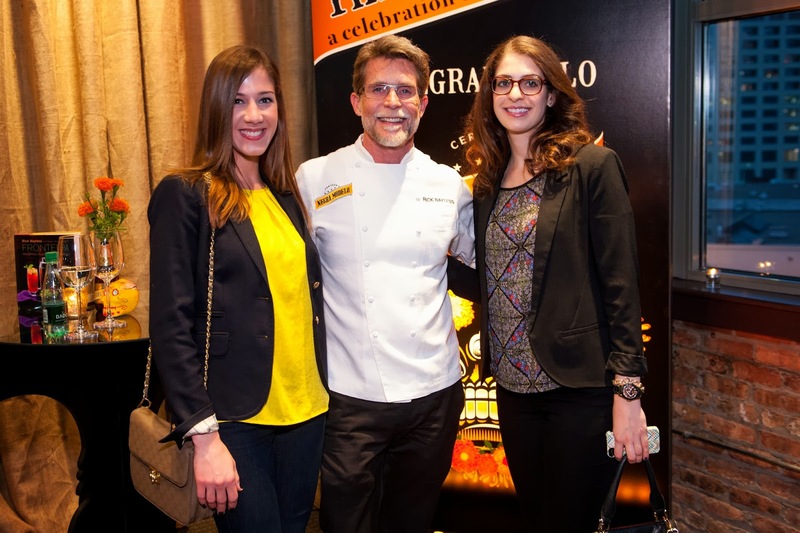 Celebrating Dia De Muertos with Chef Rick Bayless & Negra Modelo! This past Saturday, I was invited to a one-of-a-kind celebration of Dia de Muertos (Day of the Dead), sponsored by Negra Modelo. The event took place at Chicago's premier culinary and hospitality college, Kendall College and featured an evening full of drinks, food, entertainment, and a live cooking demonstration from chef Rick Bayless! 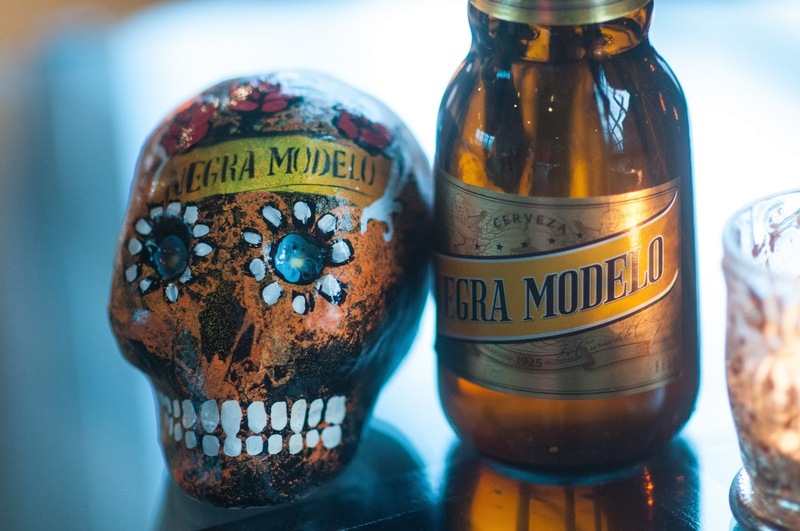 The event's sponsor, Negra Modelo, is the top-selling dark beer in Mexico, as well as the second-most-imported dark beer in the U.S. Though it's dark in color, it's a very light, easy-drinking beer, with a malty flavoring. 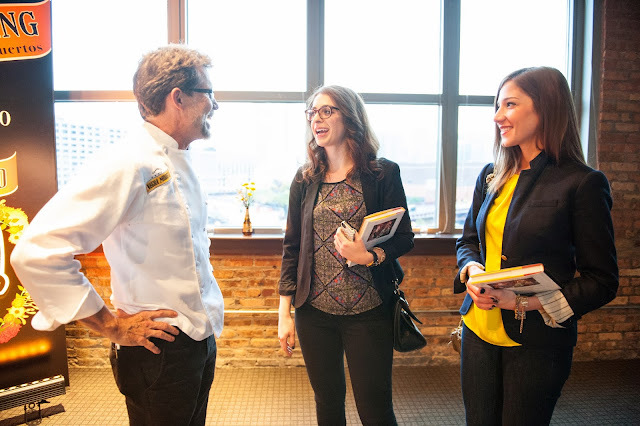 The evening started off with an exclusive Meet & Tweet allowing local Chicago food bloggers to mingle and meet with chef Bayless. I had the chance to chat with chef Bayless about the foods we were going to enjoy that evening, including a chocolate cake with a mole sauce made with Negra Modelo. 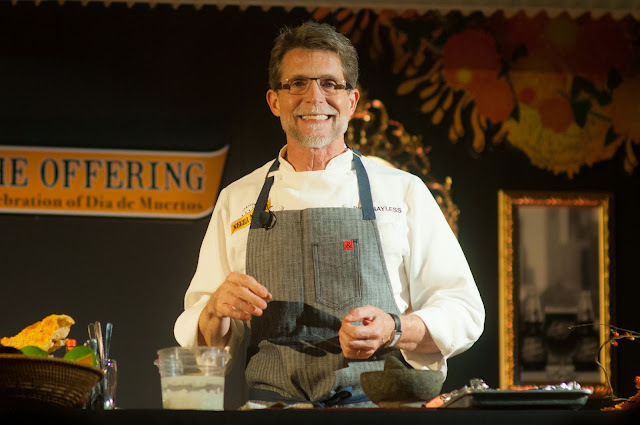 The sauce is actually something his team has been making for 23 years at his restaurant, Frontera Grill! Chef Bayless was also signing copies of his latest cookbook, Frontera: Margaritas, Guacamoles and Snacks. After the Meet & Tweet, we were greeted by a mariachi band that gave an impromptu performance and led us into the main event. 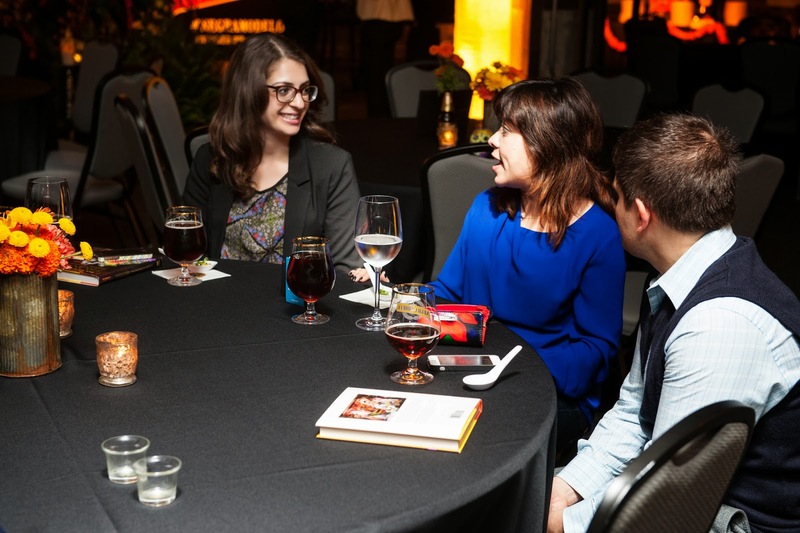 The space was beautifully decorated with yellow and orange flowers, Negra Modelo bottle centerpieces, and authentic sugar skulls painted by local Chicago artists. We also enjoyed some passed bites while getting to chat with other local food bloggers! I had the chance to meet Brenda from La Vitamina T! 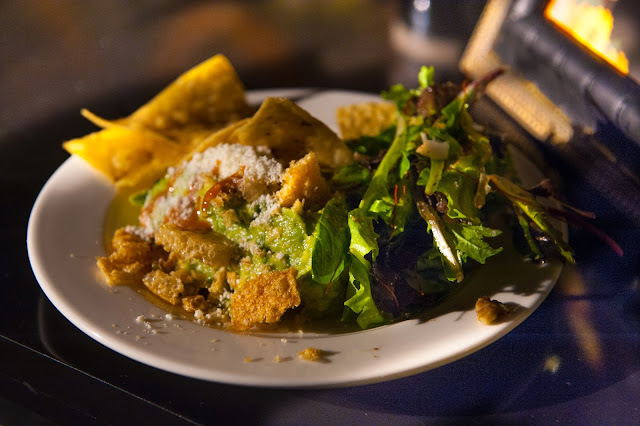 Chef Bayless took the stage to prepare roasted tomatillo guacamole with crunchy chicharron (you can find the recipe at the bottom of this post!). I thought I had my guacamole-making skills down, but after seeing chef Bayless's demo, I certainly had a lot to learn! One of the most interesting facts I learned was that avocados take one year to grow to maturity. Chef Bayless recommended purchasing your avocados a week before you intend to use them in order to get the perfect ripeness. 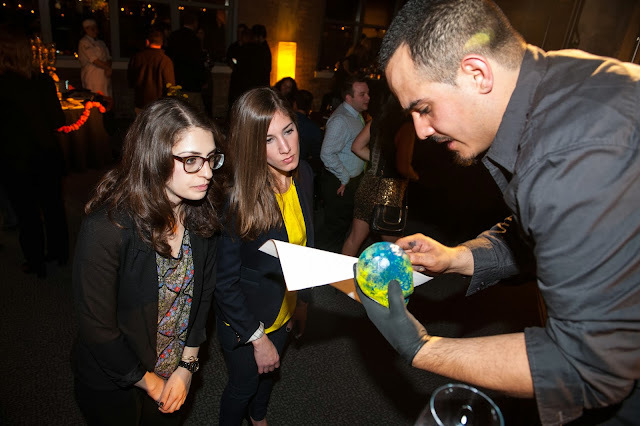 He even explained how he gets avocado deliveries direct from Mexico and each avocado has its own cradle. His restaurants also store their avocados at about 50 degrees. Other tips Rick offered included soaking your raw onions in cold water to "de-flame" them, roasting, not boiling, your tomatillos, and NEVER EVER discarding the seeds from your chilis. After the cooking demonstration, we had the chance to sample some amazing Mexican food at four different food stations, all served by current students at Kendall College. 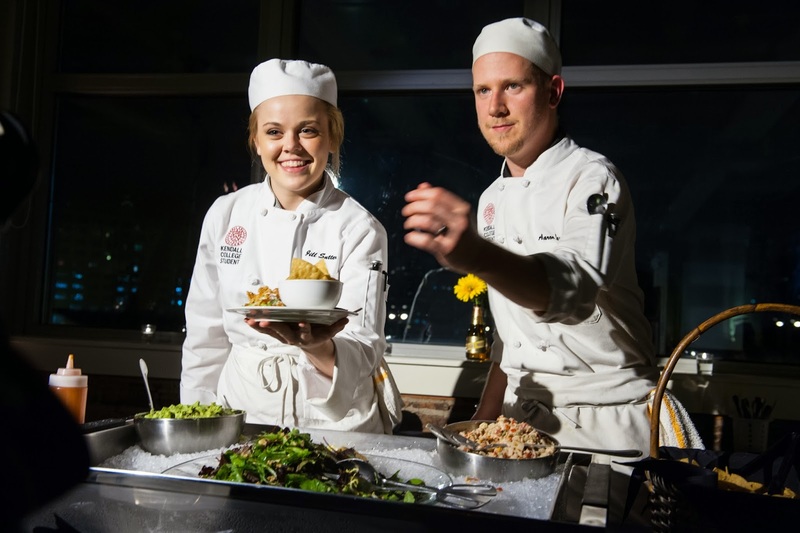 The first station featured the guacamole chef Bayless made, as well as fresh ceviche. This ended up being my favorite station because of the freshness of the ceviche. It was by far the best ceviche I had ever had! The acidity and spiciness were pure perfection. 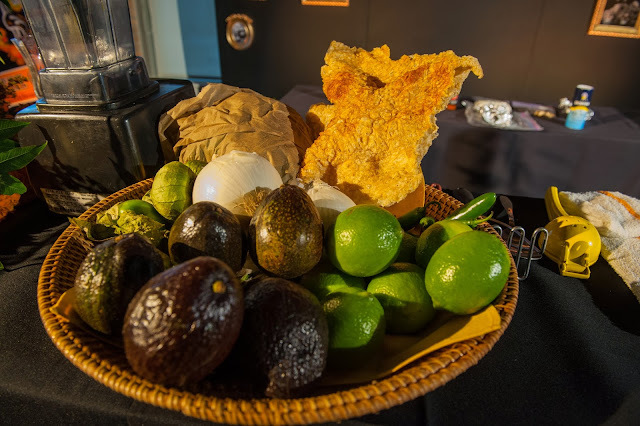 The guacamole was delicious of course, and had an interesting crunch from the chicharron, or fried pork rinds. The second food station featured two different moles, one vegetarian option and one beef option. The best thing about this station was watching the corn tortillas being made by hand right in front of us. In my review of Frontera Grill on this blog, you can see how much I raved about the tortillas at Frontera! There's nothing better than a fresh, warm, corn tortilla to cradle fresh and flavorful ingredients. The third station had corn tamales topped with creme fraiche and queso anejo. These little pockets of heaven were pleasantly sweet and had a pillowy soft texture. The creme was extremely decadent and melted in your mouth! The fourth and final station was the dessert station! By the time I visited, they had run out of the chocolate cake with mole sauce, however, I still got to try a pecan chocolate bar and shortbread cookies. The bar had a slight chocolate flavor, without being too sweet, while the cookie reminded me of a WAY better version of a pecan sandie cookie. It crumbled in your mouth and had a buttery texture. After chowing down, we were able to select a handpainted Dia de Muertos sugar skull customized with our name written across the forehead. The sugar skulls were painted by three local Mexican artists who created a variety of beautiful designs. Overall, it was a fabulous evening celebrating the food and culture of Mexico! I loved trying a variety of authentic Mexican bites from one of the best chefs in the country, and it didn't hurt to get to wash it all down with one of the best Mexican beers! apart.) Chop them into rough ¼-inch pieces and scrape them into a large bowl. top to bottom and back up again. Twist the halves in opposite directions to release the pit from one side. back of a large spoon, coarsely mash the avocado and tomatillo together. not serving right away, cover with plastic wrap directly on the surface of the guacamole and refrigerate. shards by thinly slicing it) and sprinkle it over the guacamole. Drizzle with the hot sauce and sprinkle with the cheese. Note: Compensation was provided by Crown Imports via Legacy Marketing Partners. The opinions expressed herein are those of the author and are not indicative of the opinions or positions of Crown Imports.